For the fifth year running and their Grand Finale, over 50 employees from Unilever UK took on the challenge of a 180-mile charity cycle in memory of their colleague and friend, Mel Jaggard. Louise Newton, Charity Manager at Get A-Head said: “Le Grand Finale of Miles4Mel was all it promised to be, the sun was shining as the riders crossed the finish line in Gilwern! 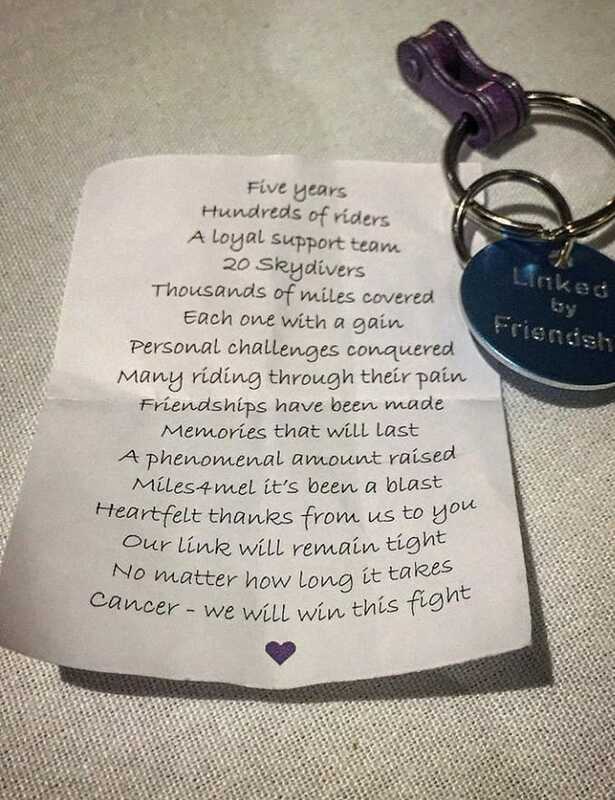 5 years of amazing fundraising, focus, energy and commitment and over £300,000 raised for Get A-Head and research into ACC (Adenoid Custic Carcinoma). The Link between the Miles4Mel team at Unilever and Get A-Head is a special one and we are immensely proud to call them friends of Get A-Head. My special thanks go to Simon Fisher, who tirelessly organised and championed this event year after year, along with support from Katherine Carter, Frank Murphy and Jo Bacchus – and of course to each and every rider, skydiver, cake baker, quiz evening orgainser, music night planner and so many more that have contributed to the phenomenon that is Miles 4Mel.